We are amateur astronomers who lives in the Jacksonville Florida area. 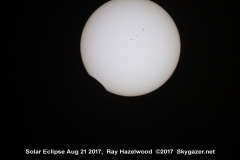 Here is a time lapsed video of the Solar Eclipse on Aug 21 2017. It was taken in Columbia SC about 1/2 mile from center line. ENJOY! View some of my still shots in the Solar Eclipse 2017 photo gallery. Mike Reynolds really wants you to see the Great American Eclipse of 2017, during which darkness will descend upon a 70-mile swath of America, coast-to-coast, from Oregon to South Carolina. That darkness – the path of totality – is so temptingly close to Jacksonville, after all. And on Aug.